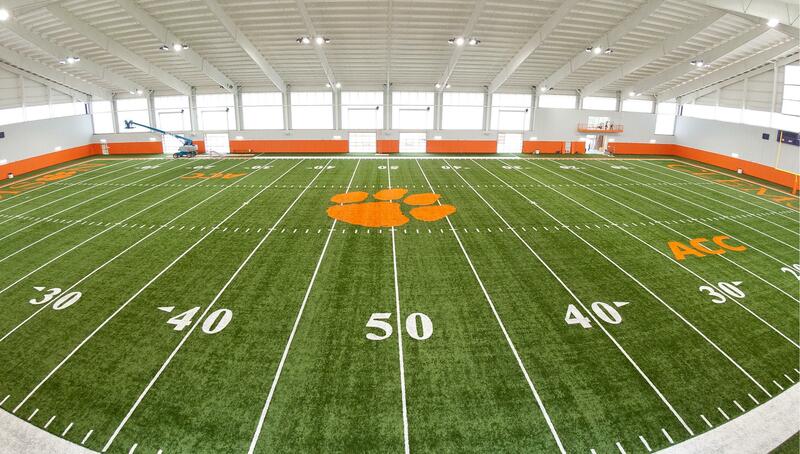 ClemsonTigers.com has added a tour of the new Clemson Football Indoor Practice Facility to its Clemson360 Virtual Tours feature on the site. The building houses an 80,000-square-foot practice area that includes a full football field with ample sideline space, a fully-functional scoreboard, four play-clocks and a videoboard, that allow for the simulation of a game-day experience. Fans can view 360-degree tours of all of Clemson’s Athletic Facilities by visiting ClemsonTigers.com and clicking on the Clemson360 Virtual Facility Tours link in the Facilities or Fan Zone drop-down menu, or on each individual sport page. Click here to read more about the facility in an article published in the football game program on November 24, 2012. Note: The official dedication ceremony for the Clemson Football Indoor Practice Facility is being held today, Friday, January 25, at 1 PM. All fans are invited to attend. Click here for detailed information.